Who loves a good Crock Pot recipe?! 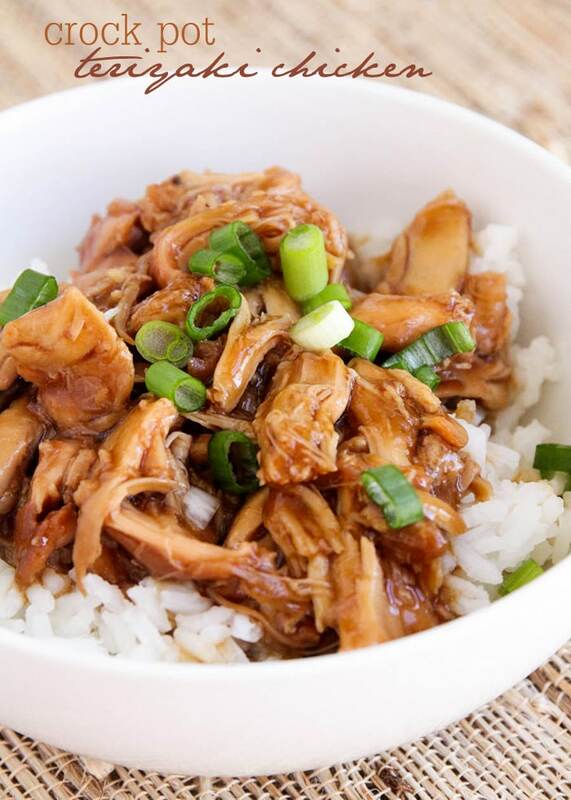 Slow cooker recipes are great any day of the week, but they’re definitely my best friend on Sundays. With church and attempting to take the day to rest, I really rely on those Slow Cooker recipes and love that they usually require little work and are so yummy! Our favorite Sunday crock pot recipe is our Roast recipe since it’s super simple!! 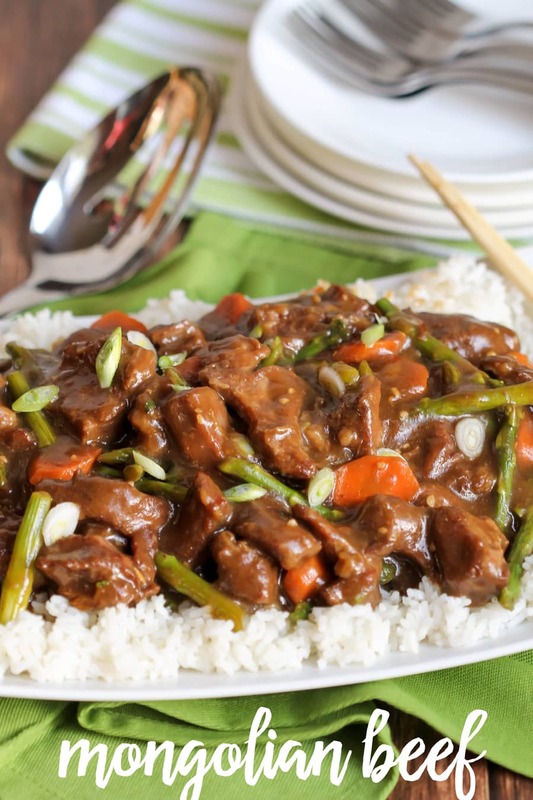 Fortunately, I have another great slow cooker recipe to share with you today for Mongolian Beef. 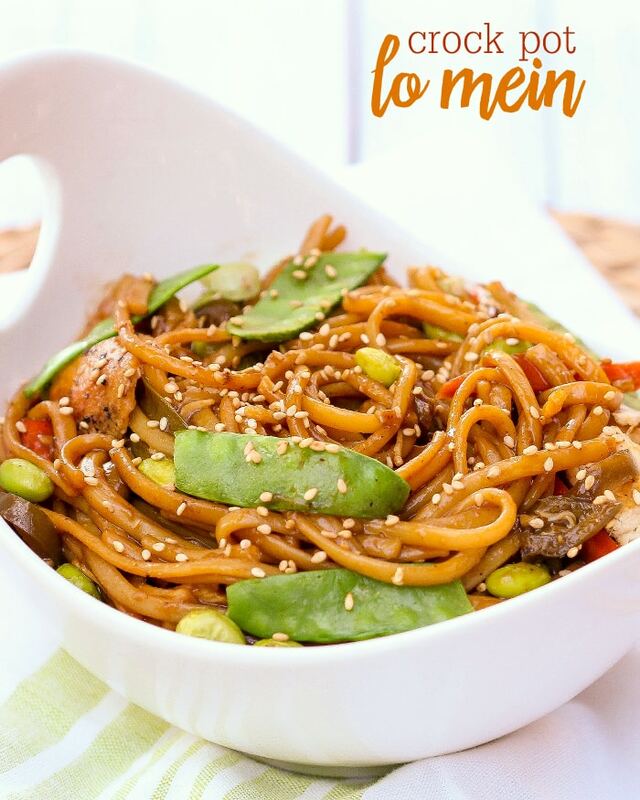 You guys know how much we love Asian food, so we were excited to give this recipe from Jo Cooks a try. We decided to use a chuck roast instead along with one of our favorite veggies (asparagus) and decided it’s a KEEPER!! After cutting up your meat and dipping it in cornstarch you literally dump everything else in to cook. 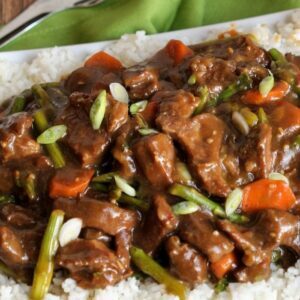 If you love easy recipes as much as I do, then you’ll love this Crock Pot Mongolian Beef recipe! 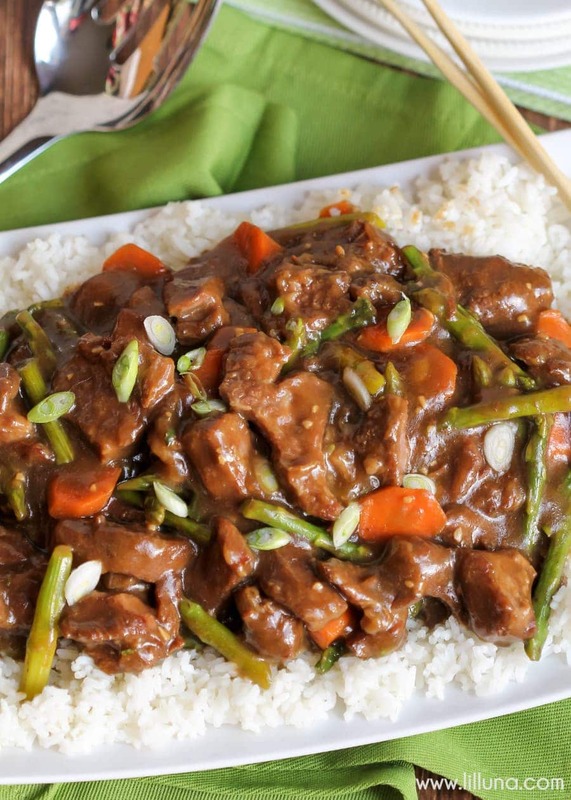 Crock Pot Mongolian Beef - SO simple and delicious. It will be a new favorite! Your crockpot does all the work! 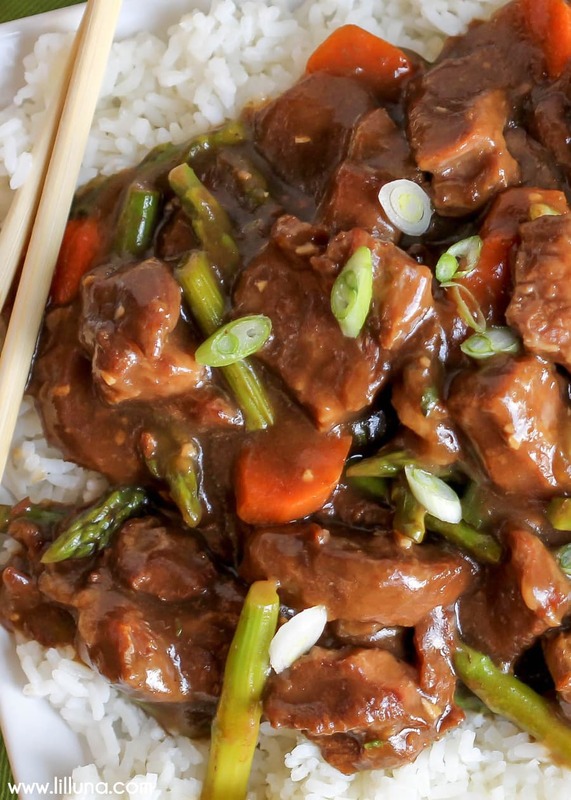 Mix your asparagus, carrot, and seasonings together and add your chuck roast! Coat meat pieces with cornstarch and set aside. Mix all remaining ingredients in your crock pot and then add your beef, toss well. Cover and cook on low for 4-6 hours. Serve over rice. 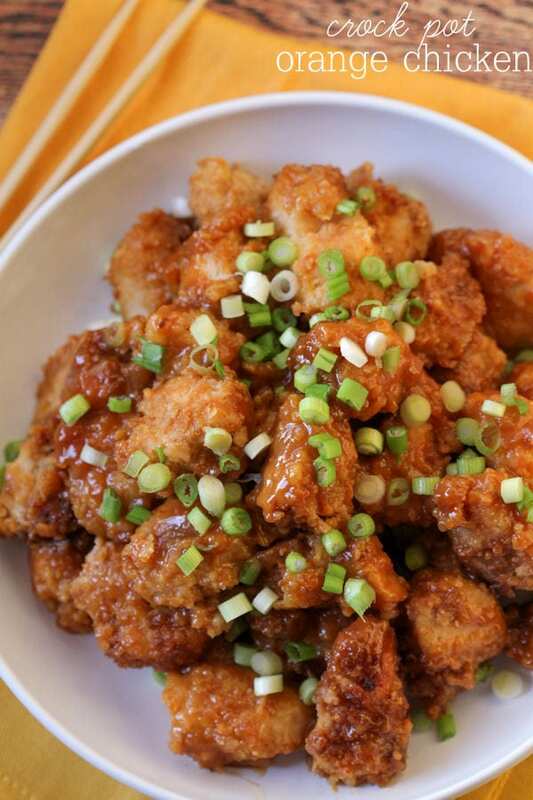 I am seriously obsessed with Asian food and am so glad to have another delicious Crock pot recipe to enjoy on Sundays! For all Crock pot recipes on the site go HERE. For all dinner ideas go HERE. Such a lovely recipe! Just discovered your blog and loved it! Definitely going to give your page a like 🙂 I’m also a mom blogger and I would absolutely love it for you to check out my blog http://www.coolbusymoms.com and get your feedback ! Super. I like Crock Pot!!! Haha..me too!! Anything to make things simpler! Thanks!